It has been a while I haven't posted anything about Asian food since last October and I'm pretty sure you readers are looking forward for my next Asian recipe. This recipe is a classic winter comfort soup that is easy to assemble. However, it takes quite some time to cook. For the vegetarian version, water is substituted for vegetable broth and obviously, the ribs are omitted. 1. 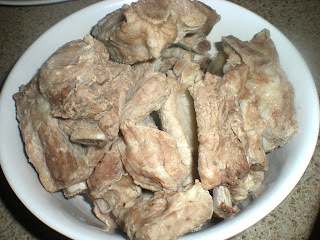 In a medium pot, place ribs in water and bring to a boil. Reduce to a simmer and remove scum from the top of the liquid. Simmer for about an hour or until almost tender. 2. 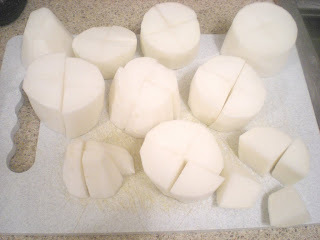 Meanwhile, peel and slice daikon into 1'' thick rounds, then into quarters. 3. Add daikon to the soup, and simmer for 45 more mins or until daikon and ribs are tender. Add salt to taste. Serve. We have a chilly rainy day here today. This looks worth trying. Sounds good! I love playing aroundd with daikons. Usually I put them in salads - this is a fun way to use them - warm and comforting. I have not cooked with Daikon but I would love to. This very delish, Victor! I've never had daikon soup before! In fact, I've never used daikon as anything other than a pickled garnish... Thanks for contributing to my culinary education! 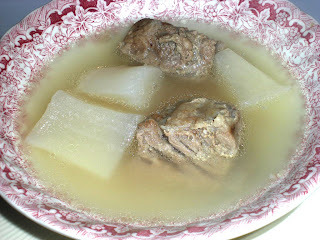 You know, I've never used daikon before, but since you mentioned short ribs, I just might have to change that! I have been wanting to use daikon in something, only because I see it on Iron Chef all of the time. :) This sounds fabulous - and simple to prepare. Love the short ribs - bet they're so nice and tender. Thanks for all your comments, I always thought that people knew about how to use daikon. Probably as an Asian point of view, it seems pretty obvious. Well I'm glad you all learn something new. Love how you use the daikon radish. I love this radish and this a nice marrying with short ribs. I look forward to giving this a try in the future.